In honor of the yearlong anniversary of America’s Civil Rights Movement, Moment is collecting and sharing stories about Jews and Civil Rights. Here are two more, submitted by our readers. “My father, Uri Miller, an Orthodox rabbi, was an impassioned advocate for civil rights all of his adult life. I remember as a child when he participated with clergy of other faiths in a demonstration to integrate Baltimore’s only amusement park and was fearful that he would be arrested. And I remember the sermons he preached against segregation to congregants who did not necessarily support integration. But it was on the larger national stage that he was most effective. As early as 1946, under my father’s leadership, the Rabbinical Council of America advocated for continued support and expansion of the Fair Employment Practices Commission which during the war had sought to end discrimination against African-Americans in employment practices in war-related industries. And as president of the Synagogue Council of America, he ensured that the spiritual leadership of the Jewish community was both engaged and represented in the momentous civil rights struggles which took place between 1963 and 1965. He spoke eloquently at the March on Washington but perhaps his greatest accomplishment was as an organizer and leader of an interfaith rally (the Interreligious Convocation on Civil Rights) described as “unparalleled in the annals of worldwide religion.” Both John Kennedy and later Lyndon Johnson had urged the clergy to become active advocates of civil rights legislation and they answered the call. Prior to the rally, on April 28, 1964, an interfaith trio of seminarians – Catholic, Protestant and Jewish – maintained a round the clock vigil at the Lincoln Memorial. The proposed Civil Rights bill languished in Congress as a filibuster in the Senate entered its eighth week. But the rally exceeded all expectations and provided a much-needed booster to flagging spirits. Approximately 6,300 clerical and lay representatives of Jewish, Roman Catholic and Protestant faiths attended, overflowing the venue which had only 3,800 seats. Leaders of all faiths spoke passionately, calling for immediate passage of the legislation to end the moral crisis of the nation. 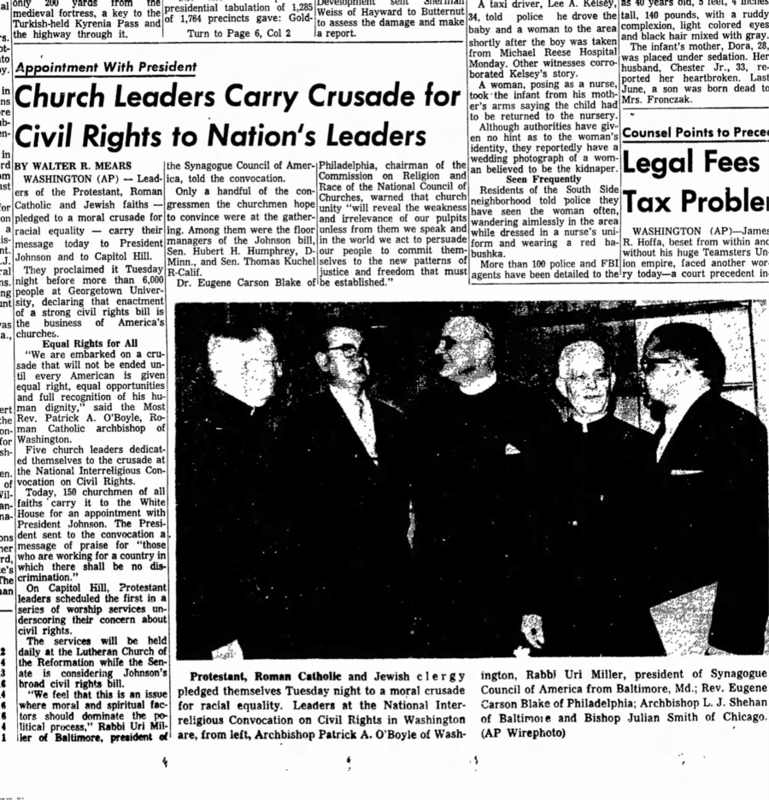 The rally was hailed by the civil rights backers in the Senate as a decisive gesture of support and the next day the religious leaders met with President Johnson. Johnson thanked them and talked about how important religion was in remolding social institutions and “illuminating the dark places of the human heart.” He said it was their job to reawaken the conscience of the country in their congregants. “There were big sit-ins planned for most of the group, but my partner and I were on our way to desegregate a bowling alley. He was African-American, a college student from Baltimore. I was white, already a workingwoman from New York. He was mature and disciplined and annoyed that he had been sent off with me. It meant that he would be following orders to not resist the law. He would not be going to jail only because this sit-in was an experiment and the CORE planners for the day did not want the girls from New York to end up in jail. My bus left from New York University at 5 a.m. and arrived at a church, south of Cambridge, MD at about eleven. Our busload of mostly white students was welcomed into a spacious recreation hall where a group of local college students were waiting for us. The organizers from CORE (Congress of Racial Equality) gave us our assignments and our partners. Wherever we went together, we had to walk away peacefully even if we failed in our assignment. My partner and I set out from the church on to a broad boulevard. I was impressed by how open and lovely the boulevard was. He was focused on following our map and giving me directions, “we turn here, wait for the light.” He was handsome in a white shirt and tie, light jacket and slacks. He followed every turn and twist of the streets, never unsure of where he was going. When we turned onto a side street after nearly an hour of walking, I saw the sign for the bowling alley. My partner held the door open for me and we walked in as far as the entrance. “You are not welcome here,” said a burly man from his high stool behind a faded wooden counter. “Neegruz are not welcome because there is a law against it.” I stood with one hand on the door. We waited for about ten minutes, standing still as palace guards. I was nervous, worried that I didn’t know how to bowl, surrounded by the smell of sweat and the lack of windows, hardly daring to look at the bowling alleys until a state trooper walked in. He was tall, thin, blonde and awkwardly working hard to unfold a piece of paper. Then he read us the Jim Crow law that gave business owners the right to legally refuse service to people because of the color of their skin. As the state trooper read this law, which I thought must apply only to Maryland, the bowlers, some standing with their bowling balls in their hands, watched and listened in silence. Gradually, I had to come to grips with the fact that this was the law of the land. It was broad and encompassing, not just about public water fountains, which we had very few of in New York. When the trooper finished reading the law, he pushed the paper into his pocket, and left without looking at us or speaking to the man who had requested his presence. Following our instructions, we turned to leave right after him. “Well, what are we going to do now?” my partner asked, a little grumpy. It had begun to rain, but it was too early to go back to the church. “I don’t know.” I said, still in shock after hearing the Jim Crow law. We began walking in circles in front of a bowling alley, without a poster to show what we were doing. Drivers stuck their heads out of their windows to stare at us. The state trooper stayed in his car. The rain came down on us. The pavement was covered in puddles. I was wearing a spring coat from Ireland, nicely woven, but I had no hat, just a soaking wet scarf. My partner had no coat and no hat. After we walked silently for about thirty minutes, the state trooper got out of his car and said, “Have you had enough?” So we left. On our way back to the center of town, we decided to see if we could get a sandwich at one of the lunch counters along the boulevard. I suspected that, like me, he had not had breakfast. It was about two in the afternoon. “Girlie, what can I do for you?” I heard from behind the counter before the counterman saw that I was not alone. “We would like to get a sandwich.” I said, shoulder to shoulder with my partner. “Oh, I can’t,” said one, “You can’t.” said another, and, “You know you can’t. Sorry.” said a third and fourth. We selected seven ounces of baloney and half a loaf of bread, and mayonnaise. We stood at the back of the store and broke open the packages, put the meat between two pieces of bread, pushed the mayonnaise out of a tube, and ate. We shared the cost. By the time we were ready to walk back to the church, the two sides of the wide main thoroughfare were crowded with blacks and whites on opposite sides of the street, shouting and throwing rocks and bottles. A bonfire started. Nobody disturbed us as we walked through the rain to the church. My light brown hair was the consistency of stringy mud and my bangs were down over my eyes. But all I could think about was that I would be leaving in a few hours. And they would be staying. Bob Adelman, the photographer for CORE, was there to take photos of what was supposed to have been an important sit-in of restaurants along Interstate Route 40 to Washington, DC. African diplomats had asked President Kennedy to see if he could make these restaurants available to them as they traveled to and from the south. Kennedy had convinced a few of the restaurants to comply. Most had not.